If you want to one thing about the Model United Nations society, it’s that we live for conferences. We all have a great time at our regular debates of course, but the whole weekends we spend thrashing out solutions to international crises with students (or delegates, I should say,) from other distinguished Universities around the world are the highlights of our year. As such, the 16 of us were trembling with anticipation for the first conference of the year, held at the University of St Andrews – SaintMUN. MUN conferences operate by having each delegate being assigned a country to represent and a committee to debate one or two topics in, with the hope that resolutions for how to address these issues will be created and agreed upon. At the largest conferences the committees reflect all the major UN institutions, though SaintMUN being one of the smallest had 3. Firstly; DISEC (Disarmament and International Security) arguably the most important, and certainly the most publicised committee had the small task of achieving a united position on nuclear disarmament… It’s of little wonder that after 10 hours of debate over the course of 3 days, involving much hashing out of ideas, trading of diplomatic insults and endless compromises, nothing was agreed. Though as one of the proposals was to distribute nuclear weapons to poorer nations through a “Nukes for the Needy” programme, that’s probably just as well. In the next room, the European Council was tackling the issues of EU expansion and the idea of an EU military. Though not strictly a UN organisation, Model EU sessions have the benefit of being able to simulate properly funded proposals, enforceable resolutions and, well, look a lot more effective than the UN. 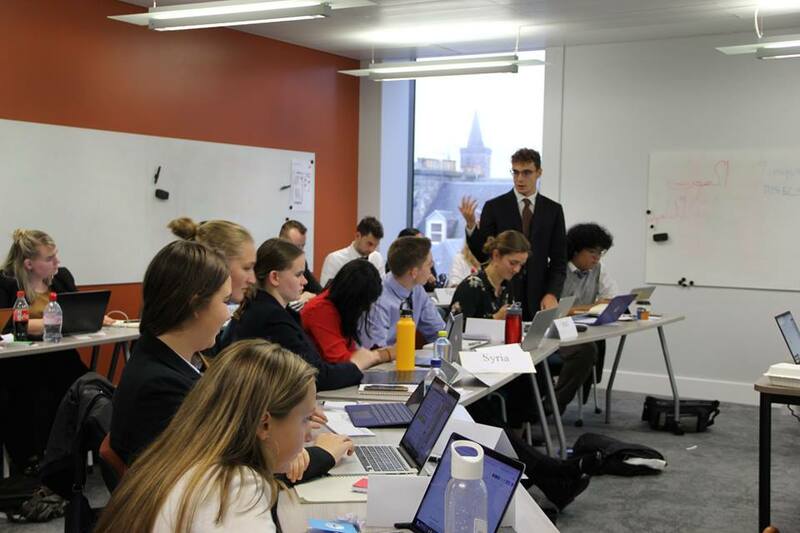 The committee managed to muddle through the technicalities of the Copenhagen Criteria (the set of standards nations must meet to join the EU), and despite the UK receiving much Brexit-based scorn, a resolution was agreed on. The remaining participants were involved in a simulation of an historical event, known very aptly as “Crisis.” In this case the crisis was the Russian Civil War, with people adopting the roles of Lenin, Trotsky and so on. Through intrigue and subterfuge, the course of history was changed with the Communists failing in their revolution and the Allies losing the First World War; unsurprisingly leaving everyone involved utterly exhausted by the end of it. Of course, there’s more to MUN than debate, with most of the conference funds being sucked into the celebrated socials; Friday included drinks at the Adamson bar before the Dundee MUN society ritual of dinner at Nando’s; (it should be noted that whether we are in St Andrews, Edinburgh or Paris the allure of piri piri sauce and unlimited re-fills will trump any attempt to appreciate the local gastronomy). Leaving the main event to the Saturday; the formal dinner at the Scores hotel, which, what it lacked in duration time it certainly made up for in warm atmosphere. As any MUNer will tell you, the biggest take-home from any MUN conference is usually not the obscure factoids about international treaties, nor the efforts that go into writing amusing notes, but the friendships that are forged in a way that only 2 and a half days of near constant intellectual (and not so intellectual) discussions, co-operation and socialising with students of shared interests can bring about. Whether it leaves you drained or spurred into action, everyone feels it is worthwhile, and we can say with enthusiasm that all the Dundee delegates did the University proud.